Foucault states that the liberal art of government is founded on the very rationality of the governed themselves. This concept of governmentality is not just a tool for thinking about government and governing but also incorporates how and what people who are governed think about the way they are governed. In neoliberal fashion, they sought out to limit the extent of the state in the face of a notion of civil society. In this, the idea of state phobia serves, then, as a kind of preface to the genealogy of neoliberalism. The economic subject, that is inherent to the neoliberal civil society, confuses the actual “problematic” situation with “the great fantasy of the paranoid and devouring state”. 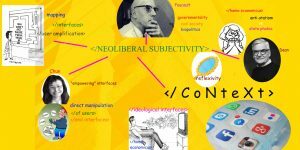 As a critical consequence state phobia deprives its subjects of the capacity to identify the real sources of this kind of suspicion, something Foucault identifies in the formation of neoliberalism in the years 1930 to 1945 (Dean 9). One way of being governed is through interactive interfaces that offer their users a way to map and engage a complex world, driven by invisible laws of late capitalism. These interfaces induce the user to map continuously so that the user in turn can be mapped (Chun 59). One way, the interfaces can give the users a feeling of self-empowerment and a feeling of being in control. On the other hand, the idea of empowering interfaces is driven by a dream of individual control, of direct personal manipulation, and thus, of the system it indexes or represents (Chun 63). This way, mapping allows us to see ideologies at work and how it reproduces these ideologies. These ideologies, then, turn individuals into subjects, since they persist in one’s actions rather than in one’s beliefs. Even though people know very well what they are doing, they still do it (Chun 67). « Can we deter tech monopolies and combat income inequality through a reformed open source software development?